Straining on the banister railing I leaned over to peer where Ron was pointing his flashlight. Following the beam of light, there tucked behind the towering chrome tanks was a giant portrait of the saint. Dusty and faded the saint stared back stoically from a gold rimmed frame. It was hard to believe I was standing in the center of a modern brewery rather than a museum or abandoned relic. Though, that is what the Taft Ale House could have been. Looking around at the high ceilings from the mezzanine of the old church there was no indication that the building had been by ravaged by fire, time, or otherwise. The Taft Ale House team did a remarkable job restoring the church to its former glory. Hand carved banisters, restored glass, sleek wooden floors and brilliant low hanging chandeliers all graced the revived building. 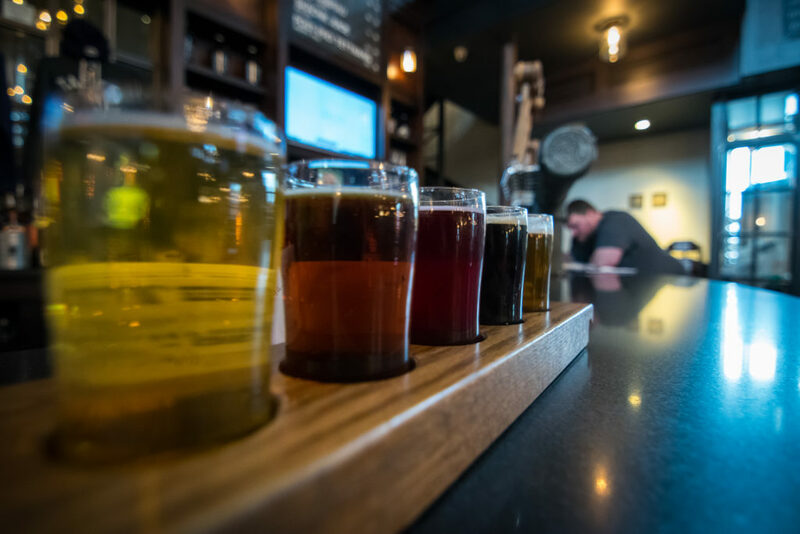 After taking in the architectural work, Ron dipped further into the ale house’s and neighborhoods history. 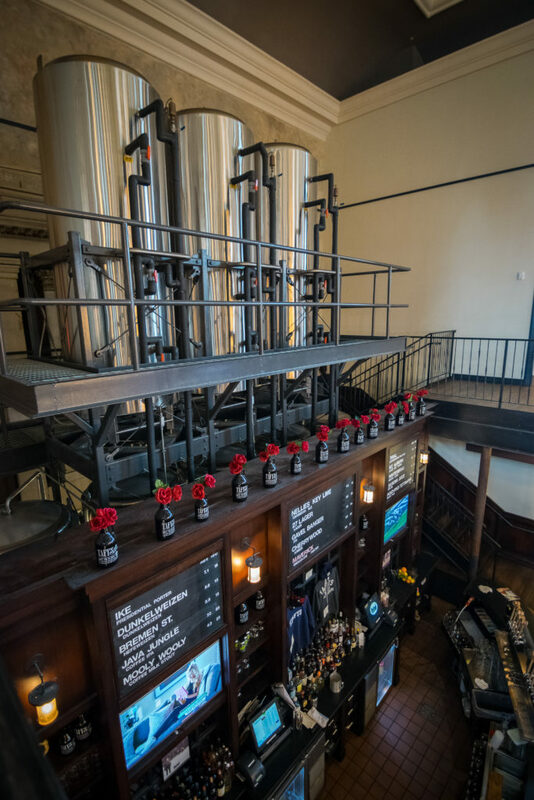 In the heart of Cincinnati’s historic Over-the-Rhine district Ron described an era alive with German immigrants with a passion for brewing beer. Taprooms, bierhauses, and pubs were the norm as the city was teeming with Germans practicing their craft. As the country powered into the 20th century Cincinnati and Over-the-Rhine were soon changed forever, seemingly overnight. With the passing of prohibition the many bierhauses were outlawed and abandoned. The economy of the neighborhood declined and as the country was dragged into the global struggle of the First World War Germans at home became antagonized and cast as villains. It wasn’t long before the protestant congregation relocated and abandoned the church. Sitting down at the bar to a small row of beer, I listened at and let Taft Ale House’s love affair with history continue. That love affair just so happened to focus on Cincinnati native and 27th President of the United States, William H. Taft. It soon became apparent that the essence of Taft was infused into everything from the alehouse décor to the beer in my pint glass. The Gavel Banger, an American IPA and reference to Taft’s time as Chief Justice of the Supreme Court is a refreshing and juicy pale. Dry hopped with Amarillo, Citra and Simcoe hops it is well rounded from get-go to finish with just the right amount of bitter bite. Sourcing coffee from local provider Deeper Roots, the milk stout, Mooly Wooly takes this infusion of coffee and oats to make a heady and delicious stout. The name of course is a nod towards Taft’s pet cow that once could be seen cropping the grass of the White House lawn. In homage to Taft’s wife I picked up a glass of Nellie’s Key Lime Caribbean Ale. A wheat beer at heart Taft’s Ale House brewed it straight with key lime juice and hints of coriander. The result was a drinkable and fruity beer worthy of sipping on any hot summer day. My favorite, and reference to Taft’s birthplace Mt. Auburn Winter Brown is a seasonal ale brewed with mushroom and maple syrup. The combination adds a hint of sweetness to the nutty brown flavor. To compliment the lineup of beer, Taft’s Ale House has a full menu of delicious pub fare. Tri-tip steak, au jous, and fresh grilled salmon all graced the menu. Sides of mashed potatoes, soups, and alehouse style onions all make for hearty meals that accompany the choices of beer well. As I departed the alehouse I was struck by Taft Ale House’s dedication to the local presidential hero as well as their devotion towards local history. 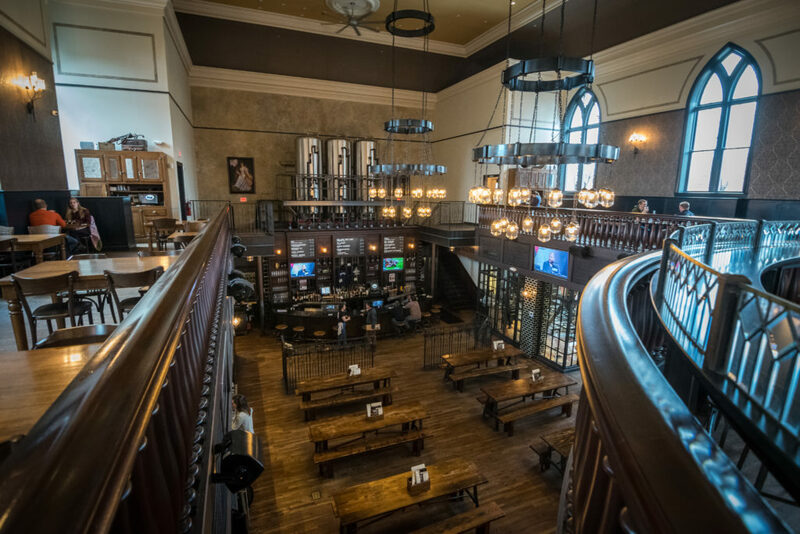 The magnificent work done on the Episcopal Church combined with their solid arsenal of beer makes Taft Ale House a worthy revival into the Over-the-Rhine neighborhood. I couldn’t help but chuckle at the brewery’s logo as I passed through the door. A silhouette of the portly president lounging in the infamous bathtub he allegedly got himself stuck in. The image showed the president holding a mug of beer high. I imagine it as a toast towards Taft Ale House, its beer, atmosphere, and food worthy of the legendary 27th president and any of his successors.